Fitting a ball into the backpack takes up a lot of space for your other equipment and Striker II Backpack features a perfect solution to that problem. With a ball holder on the outside, you are left with a spacious main compartment and two really big side pockets that can hold all your gear, and then some. There is even a small top pocket where you can store your valuable items. With this item being specifically made for ball sports (basketball, soccer, volleyball) we stacked it up against the competing models and the results were not surprising at all. 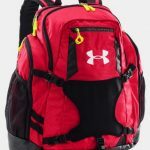 It confirmed the reputation of being one of the best sports backpacks without breaking a sweat. This is not an overly big backpack, but the way it is made allows it to store an amazing amount of gear. Since the ball is not taking up the precious space inside, you can easily fit two pairs of shoes, a couple of towels, jerseys, shorts, socks, and still not fill up the main compartment alone. After that, you are still left with 2 big zip lock protected side pockets and a small top one for your phone and wallet. In terms of storage, you will hardly find a better solution from Striker II Backpack. The reason why Under Armour has the reputation of making high-quality products is because they keep passing all the durability tests. This item is no different and it performs really well no matter what challenges you put in front of it. 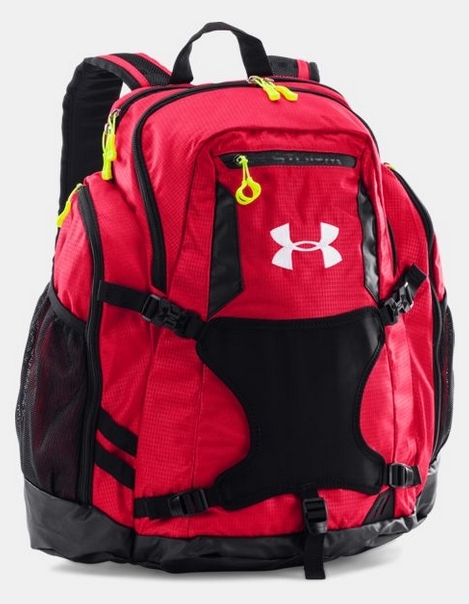 UA Storm technology implemented in the DWR Treated 600D Polyester material will keep this backpack immune to all sorts of punishment. You should be able to use this backpack with ease for at least a couple of years and some of the testimonials claim that it can even last for decades. 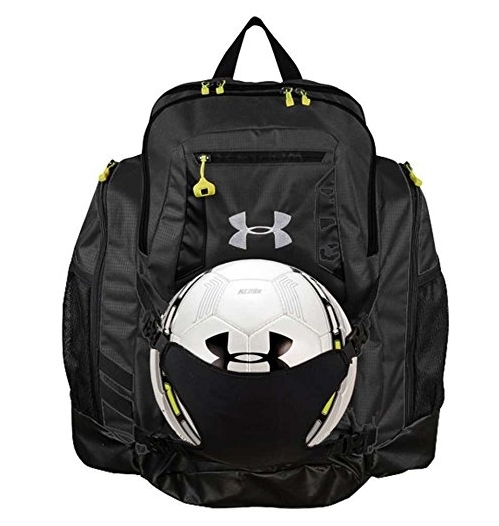 This is a thing of taste, and although we saw a ball on the outside solution many times, we really like the direction UA took with Striker II Backpack. You can detach the ball holder and use it as a regular backpack. Striker II looks nice and although we would like to see a bit more color variations, these four are fine as well, especially the black one. We rarely declare something to be expensive or cheap, but for this model it has to be said: it is affordable. Especially if you consider the value you get for your money. You will have a difficult time finding a backpack that offers better features and build-quality at a lower price than this one. It will certainly be one of the smartest buys if you decide to get Striker II Backpack. Everyone seems to share our opinion of this being one of the best backpacks in the segment as it received an overwhelming rating of 4.9 stars.